A four mile day hike to close the mountains to practice. 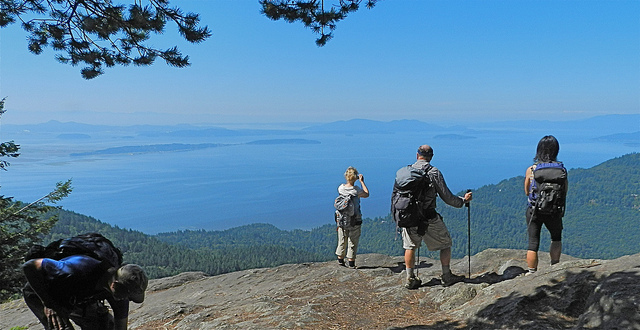 Join us for a meditation hike to the gem of the Chuckanuts: Oyster Dome.This popular local destination, a prominent rocky outcrop on the southwest face of Blanchard mountain, will be our place of Closing the Mountains for the ending of our ritual hiking season. This hike, inspired by traditions on Tibetan sacred mountains where the last ritual circuit of the season was performed by priests putting the mountain to rest, will be a 5 mile round trip with about a 1,000’ elevation gain. On the dome we will perform a ritual combining water from the three headwater branches of the Nooksack River. At the end of the hike we will carpool down to Larabee Beach for our seasons final ritual, returning water to the Salish Sea. Meet at the Dharma Hall for carpooling at 9am. Those coming from Skagit can meet us at the trailhead on Chuckanut Drive at 9:30 (please indicate in the RSVP registration where you will meet us). To make a very full day consider joining the zendo practice at 6:00am that morning. To come on this hike please RSVP with the registration form. Click the "Register" button to the left to start the process. If you choose to offer dana (details on Dana Paramita here) please visit our Dana page. Unlike our "indoor" retreats dana is not generally collected during the event.